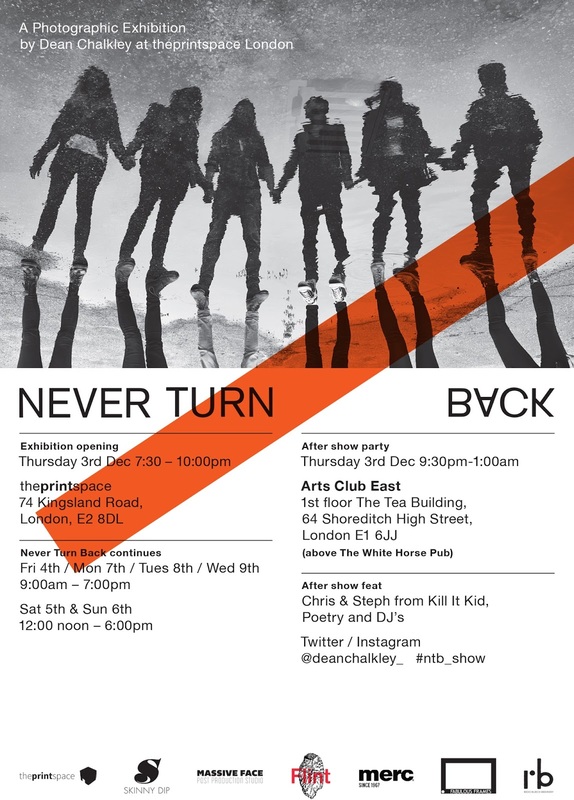 Print Space are pleased to announce their next exhibition, with award-winning photographer Dean Chalkley. Dean is launching his newest project 'Never Turn Back' (‪#ntb_show‬) with an exclusive short run exhibition at theprintspace Gallery next Thursday! The private view will take place on Thursday 3rd December, from 7.30pm at theprintspace Gallery. The show will then continue until Wednesday 9th December (Mon - Fri, 9am - 7pm), as well as opening exclusively over the weekend (12-6pm)! As part of 'Never Turn Back', Dean will also be hosting printSpaces next First Tuesdays event, taking place on Tuesday 1st December. Dean will be in conversation with Stephanie McLaren-Neckles, co-founder of Let's Be Brief, a platform that champions creative entrepreneurs. Around the much-debated topic of personal versus commercial work, they will be speaking in depth about Dean's numerous explorations into culture, from Banger Racing to Northern Soul and more. Book your ticket here now, there are limited spaces available.